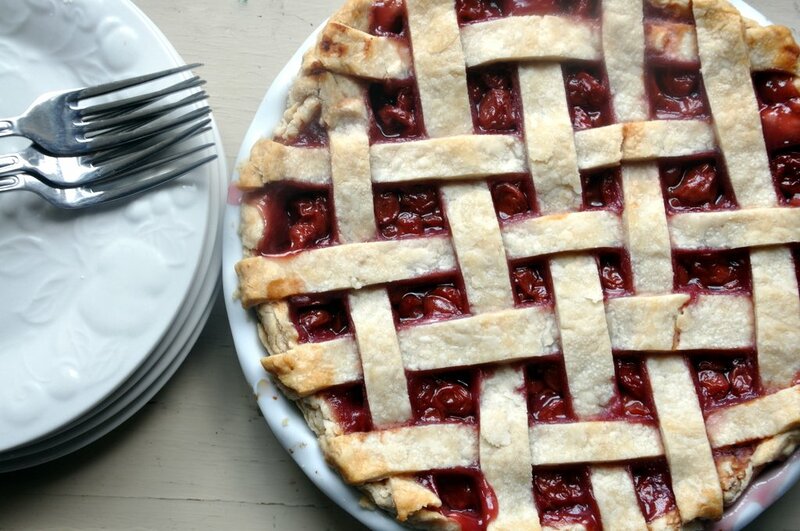 Sour cherry pie is one of the very easiest yet most delicious kinds of pie. The only problem is you need sour cherries. My mother-in-law grows and cans her own, and I’ve been lucky enough to receive several jars over the past few years. But since there is NO WAY I am giving up my stash, you’ll have to track some down yourself. I know Oregon Fruit has tart cherries, so check with their other fruit at your grocery store (or order them from Amazon). 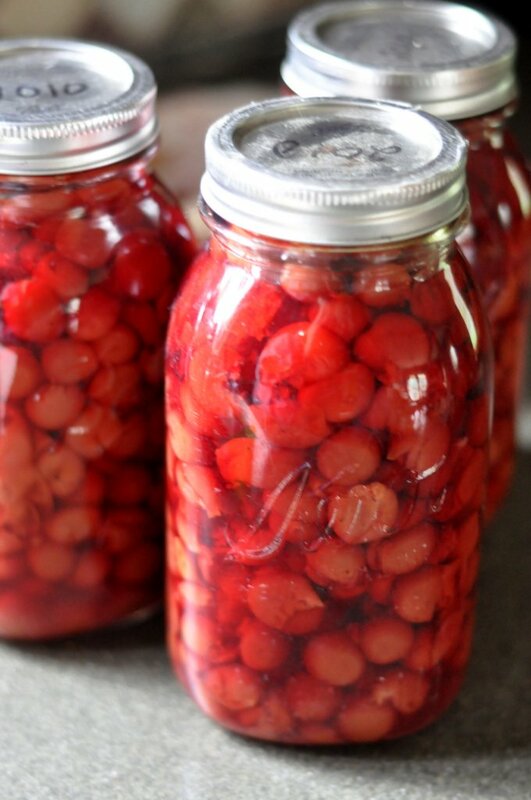 Once you have the cherries in your hot little hands, this recipe is easy as…well, you know. Throw the flour and salt in a mixing bowl. Toss in the shortening too and then mash it up with a fork until it’s in little pieces. Don’t mix it TOO well, since the little pieces of shortening in the crust is what makes it flaky. Add cold water about a tablespoon at a time until the dough is sticky enough to hold together. Do most of your mixing with the fork but make sure you test it by squishing it together with your hands or you’ll end up adding too much water. Separate the dough into to balls. Roll it out one ball, press into a 9 inch pie plate and crimp the edges. Roll out the second ball and cut into 8-10 1/4 inch wide strips. Drain the cherries but save 1 cup of the juice. Combine juice, sugar, extract and corn starch in a small sauce pan and heat until sugar is dissolved and mixture thickens. Pour cherries into the prepared crust and then pour the juice mixture over it. Use the strips of crust to make a lattice top, weaving them over and under. Pinch the edges together all the way around. Bake at 400 degrees for 50 minutes or until filling it bubbly and the crust is lightly browned. I SUPPOSE you could also use store bought crust to make this even easier, if you hated deliciousness. And America. You know what tastes even better than sour cherry pie? Sour cherry pie made by Suzanne. I’ll have to keep an eye out at the farmer’s market for some sour cherries. 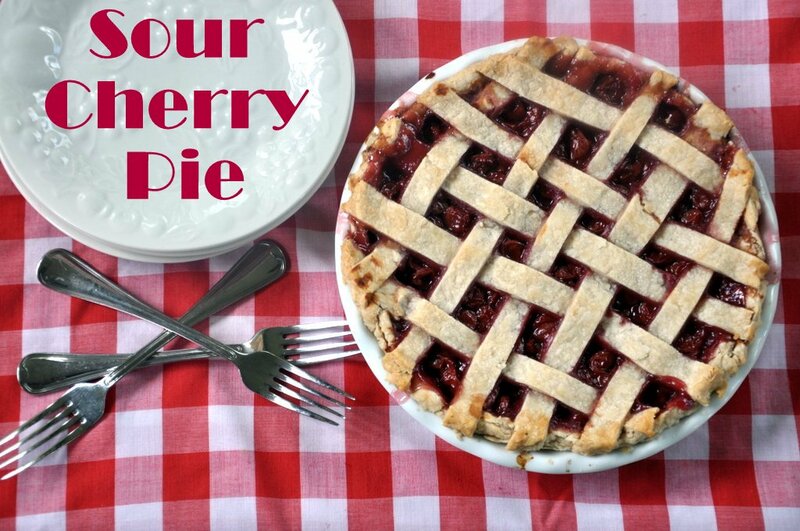 My grandparents had a sour cherry tree, and my grandma used to make a sour cherry pie when we visited. OH MAN WAS IT GOOD. Almond extract in your sour cherry pie???!! Philistine!! My MIL makes it like that and I thought she was a crazy person. It is SO GOOD. This looks amazing. I don’t think we can get sour cherries in California, I did have one once though because my sister had a tree in the back of her house in Michigan the the retired guy across the street that he could come over and pick all the cherries he wanted if he gave them a pie. It was AMAZING. Thanks I was just thinking of starting a diet, and now you got me craving Aunt Carol’s Sour Cherry Pie. For those of you who haven’t tried you are totally missing out, and if the idea of having Almond extract in your pie, is revolting. don’t worry I will gladly eat your piece. Gee Thanksgiving and Christmas can’t get here fast enough. Aunt Carol if you are reading please send me a couple of jars of sour cherries.